…filled with sunny optimism, a breath of fresh air, and a splash of heart. If the DeLorean automobile takes you “Back to the Future,” then this train takes us back to the days of Vaudeville with a show called Moxie: A Happenstance Vaudeville, packed with nostalgic costumes, old-time music from the early 1900’s, and a variety of acts like Mark Jaster playing his musical saw, Alex Vernon as a hypnotizing man, and Gwen Grastorf as a yodeling, dancing lady. 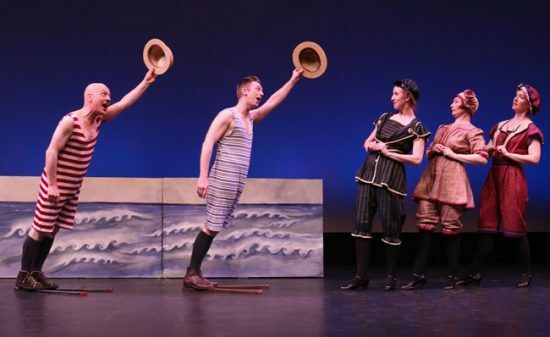 This theatrical collage, collaboratively devised by the ensemble, is filled with sunny optimism, a breath of fresh air, and a splash of heart. A highlight of this magical journey includes Alex Vernon and Sarah Olmsted Thomas on stilts as clowns while an evening sky is filled with stars and a moon. Would you agree that walking on stilts takes moxie? Besides designing the many costumes, Sabrina Mandell takes to the stage as the Maître d’ in “O Sole Mio.” In one of the funniest acts of the night, two waiters feverishly try to set the table at a fine dining restaurant. The stuffy Maître d’ makes them so nervous with expectations of nothing less than perfection that the waiters drop the ball, meatball that is. Playing everything from an upright piano, accordion, and trumpet, musical director Karen Hansen is skilled at creating just the right mood. Not afraid to join the cast on stage, Hansen even sings in a barbershop song, while playing some licks on a muted trumpet. 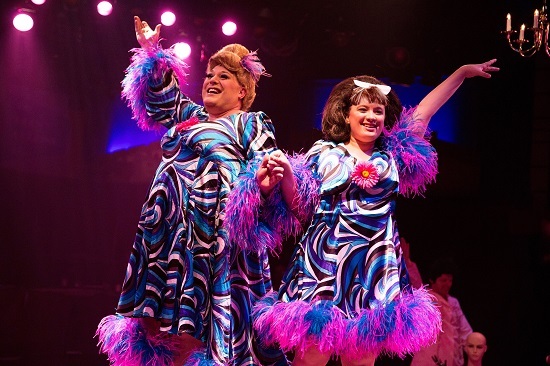 Moxie: A Happenstance Vaudeville takes us back to the good ol’ days of times gone by. If you are looking for a family-friendly show, then get on the train to visit the Round House Theatre. Moxie: A Happenstance Vaudeville plays through July 17, 2016 at Happenstance Theater performing at Round House Theatre – 4545 East-West Highway, in Bethesda, MD. For tickets, call (240) 644-1100, or purchase them online.